THE TIMES Scottish commentary has a talent to amuse, largely unintentionally, few pseudonymous cyberhecklers, and better spelling than most. The word ‘iconic’ is avoided, for which many thanks. What follows may be like Osbert Lancaster minus Lady Littlehampton in happier days, but laugh we must. Entries are sorted, most recent first, and I have tidied up a little, stylistically. Where material comes from other sources, I indicate – and shall update every few days. When I published NO GODS AND PRECIOUS FEW HEROES, SCOTLAND 1914-80 the last volume of THE NEW HISTORY OF SCOTLAND (Arnold, 1981) I thanked Gordon Brown for adding to the book’s ideas. He had a difficult time leading Labour’s YES campaign in the 1979, but his energy and good humour helped keep us just ahead of the ‘Better Together’ of the day. Still, in the preface I had to set the country against Sweden or Baden-Wuerttemberg, the latter my new home. Roughly equal to Scotland in 1911, they had doubled in population to ten million. Scotland had barely advanced to over five million. Despite the oil, the relation worsened and of Brown I had to conclude, in BROONLAND (Verso, 2010), ‘he had left the finances devastated, the economy down by 6%.’ Unsurprisingly, I am not cited in MY SCOTLAND, OUR BRITAIN (Simon and Schuster, 2014). My fellow-historian Tom Devine is, frequently. Sir Tom now backs a YES vote. 27 August. Miles Costello on Scottish or Corporate? ‘Potentially problematic … a separate currency for the country as well as its own credit rating and local regulator ….’ Isn’t it odd how such difficult issues never seem to crop up when we’re in the daily lives of the Mergers and Acquisitions boys – even when, the damage done, they swan off with huge bonuses? This may be why there are so few recognisable faces in the ‘Captains of Industry’ (translate as corporate suits) endorsing the unionist Better Together movement in the Scotsman. And, indeed, there are very few on the same level as the anti-Home Rule ‘Ragman’s Roll’ of 1933. Then, the Conservative-Liberal National Government’s MPs outnumbered the left 64 to 7. Now the Tories need the ‘Devolution Union’ as only their 12 list MSPs give them credibility as a UK party. Perhaps they might have a chance if they took a very big stick to corporate crime (there are three cases aggravated by investigative incompetence just to the right of this article) but what prospect is there of the doors of Barlinnie slamming behind Canary Wharf’s best? Lindsay – as someone said of the attempt to reconcile Ted Heath to Margaret Thatcher back in the mid-1980s: it had the news value of getting London Zoo’s pandas Chi-Chi and An-An to mate without clawing each other. Fascinating but inevitably frustrating, even when repeated with a different but no less bizarre cast. One wee problem from Broon’s past: Lord Adonis’s Hi-Speed Trains. They originated in that late phase when no-one was speaking to anyone else in Downing Street, but Gordon wanted to build them – just like the insufferable Germans or French. Alistair has become militantly hostile to the idea, and is now joined by Gordon’s former trusty Ed Balls. Alex Salmond wants priority given to a fast line started asap in Scotland, where the existing East Coast line still uses the Stephensons’ bridges, built in the 1850s, and MacNimbies are thin on the ground. In contrast to this bunch, Salmond appears the practical, pragmatic unionist, does he not? On 14 March BBC Radio Four broadcast James Graham’s clever play ‘Dividing the Union’, but not so’s you’d notice. Beaten by half a percentage point in the September referendum, David Cameron comes north to talk his way out of immediate trouble, and wrestles an agreement with Alex Salmond by conceding Scots access to the pound, in exchange for the Trident subs remaining in the Clyde for another parliamentary term. Abracadabra! The issues Lord O’Donnell raises are surely crucial. The international overreach of a moderately-sized European country – world-power status through nuclear deterrent, mammoth aircraft-carriers – is physically based on and in a nation, Scotland, determined on a downsizing to the capabilities of Denmark or Finland. Even Gordon Brown has declared the British ‘Union State’ model broken, and that a NO vote would imply a federal reorganisation. Inevitably this will centre on the ‘feelings’ of the Scottish people over the last decade: from Robin Cook’s eloquent rejection of the Iraq invasion to the National Theatre of Scotland’s BLACK WATCH: its squaddies’ bravery, sacrifice and bewilderment on the front line. It is also set against the likelihood of a new post-oil economy being evolved in the North Sea, and requiring European co-operation. The response: a cloud of unknowing, its centre in Downing Street. Federalism is neither an easy nor a stable solution to the UK’s problems, as Prof Colley appears to think. In ten years’ service on the board of Tuebingen’s Institute for Federalism Research, I was made aware of the resilient ‘mattress’ of conventions and institutions – constitutional, religious, social, economic, transport – that underlie the success of ‘co-operative federal’ Germany. Federalism, coming too late, will join the alternative vote in the mausoleum. Confederalism, which Gladstone got close to in 1886, has a chance. Not too fast, Lindsay. Ian Wood is impressive, but like most Scots entrepreneurs in ‘Rushes’ for this or that, his geld came from supplying equipment, rather than extracting/ trading the black stuff. Wood has some renewables in its portfolio, besides a subsidiary in fracking, which depends on a high oil price; he’s also into carbon capture and storage, which can squeeze more oil/gas from fields semi-depleted with old technology. But hey, as your boss Rupert would say, this is politics! Sir Ian isn’t infallible: he was wowed even more than Alex S. by the dark arts of Donald Trump, though he would probably be more critical of Gordon Brown, who sold off UK oil at its 1999 peak for $ 10 a barrel. But oil/gas isn’t the only power coming out of the North Sea. Salmond rightly stresses the new era which will open up with mass-produced subsea rotor-generators – along the lines of the 1 Megawatt Voith Hy-power rotor currently under test at the Emec facility in Orkney. Compared with manned, carbon-belching platforms these will be the silent harvesters of low-carbon power. Prof. Stephen Haseler, if I remember right, is a down-the-line republican. So too is or was your proprietor Rupert Murdoch. Despite your editorial loyalty to the Union, the prospect increases of either a Yes vote or a constitutional ‘bourach’ (a compact Gaelic word for paralysis). When you think of it, the situation the Unionists landed the UK in as Europe faced the multiple crisis of July 1914 – not, for THE TIMES, its finest hour. Further, Britain has changed since 1977, not least the affinity of Monarch and First Minister: Strichen speaks with Balmoral about more than racehorses. With her deft Irish diplomacy supplementing the Good Friday agreement, the Queen has made De Valera’s ‘external association’ principle (which underlay ‘her’ Commonwealth) the ‘dignified part’ of a confederalism that aids pragmatic co-operation. I haven’t a clue what this article is about. I was tempted to agree with MBC, then I reread the snippets from the Times and I got the message( I think), at least sufficient to produce an occasional wry smile. Readers probably need to be a lot more erudite than me to get the best from Harvie’s material ( A Times reader perhaps ). Do enlighten me. I read the Times only occasionally. Can’t afford it. I gather it is a kind of news digest. But it would be helpful to indicate the articles referred to. 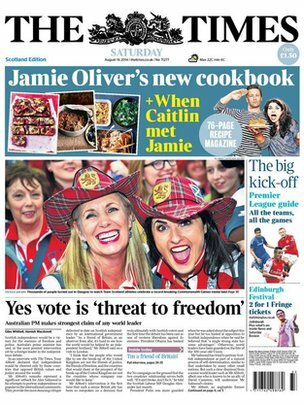 The Times is behind a paywall – it might have been better to fillet a readily available paper – Scotsman? (while it still exists? ).